As the Toronto Blue Jays aimed to avoid a sweep at the hands of the Minnesota Twins (woof) on Wednesday night, news broke that the team was close to trading veteran reliever Seunghwan Oh to the Colorado Rockies. Sources indicate #Jays close to a deal with Seunghwan Oh. Could happen tonight. RHP Seung-hwan Oh to #Rockies is a done deal, source tells The Athletic. Oh has been great in 2018, posting a 2.68 ERA over 47 innings and posting a voluptuous ERA+ of 158, striking out 55 batters and walking just ten. He should fit well in the Rockies bullpen. Oh was signed this spring to a two-year deal worth $1.75M in 2018 with a vesting option for a $2.5M 2018, according to Sportrac. For a team like the Colorado Rockies who have struggled in the bullpen this season, Oh represents a late, high-leverage relief option that, on a rebuilding team like the Blue Jays, was an unnecessary piece in the process. That being said, should the Blue Jays have been competitive in 2018, the move to sign him would have looked just as smart as it does right now, as the Blue Jays seems to have acquired a power-hitting prospect from the Rockies and a speedy outfielder in the process. The original rumours involved Sean Bouchard. He’s not in the deal, so let’s replace him with that PTBNL. IN order to keep some transparency, here’s some details on Sean Bouchard, just for fun! Sean Bouchard, who seems to be searching for a position based on his 1B/DH/OF/Misc. positions listed on Baseball-Reference, was the first name listen by Wilner via Arden Zwelling. The UCLA product has put up a reasonable BA of .272 across 126 A-Ball games, but little other than that and a solid .354 OBP. For a 1B or a corner OF his 14 homers is a bit concerning, but he’s driven in a solid 74 runs. In 2018, though, he’s struck out an ugly 86 times in 87 games at a 24% rate. It took until Thursday morning, but the highlight of the deal is OF Forest Wall, a speedy OF ranked No. 13 on MLB Pipeline. The Wake Forest product has struggled a bit after a promotion to Double-A Hartford, but started out 2018 on fire with High-A Lancaster. He’s a speed-first guy with a left-handed bat, but is unlikely to hit for much power. The Pipe has him as a 45 overall, with 60 run, 55 hit and 50 field. Wall should slot right into the New Hampshire outfield after short trip from Connecticut. The Rockies have an abundance of outfielders with David Dahl highlighting the group, so using Wall to leverage a very good reliever in Seunghwan Oh is a very solid move from a front office that’s made some questionable ones in recent years. Chad Spanbarger is an interesting name, as the left-handed hitting first baseman has walloped 41 home runs out west throughout his first two seasons in Rookie and Low-A. he strikes out a fair amount (153 times in 379 PA), but he still manages to get on base, posting a mark of .366 so far while slugging .595 for a .961 OPS. We’ll take those very low-level numbers with a grain of salt for now. So neither are prospects to get extremely excited about, but Spanberger is definitely interesting. The move will open up a spot on the Blue Jays 25-man roster, which will likely go to Danny Barnes once he returns from the DL (he’s on the rehab stint right now.) before then, there might be some bullpen shuffling, with Luis Santos being the likely first man out. And with Oh now gone, there might be some ugly baseball on the way in Toronto. We wish the best to Seunghwan Oh in Colorado. Hopefully he can fill in for a Rockies bullpen and find himself playing some competitive baseball in the coming months. *Featured Image Courtesy Of DaveMe Images. Prints Available For Purchase. 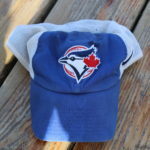 PREVIOUS Previous post: July 24th Blue Jays Minor League: Better Late than…..